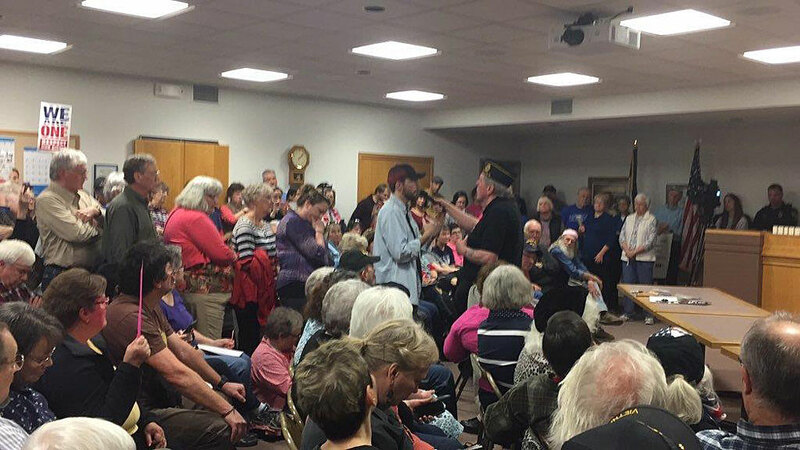 The crowd at Senator Joni Ernst’s town hall. 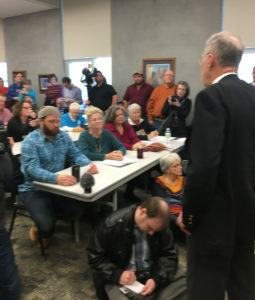 Iowa’s two U.S. senators, both Republicans, held town hall meetings Tuexday and were met by large crowds ready to voice their opposition to President Trump and GOP priorites. A crowd in Maquoketa chanted “your last term” as Senator Joni Ernst entered the room. The event ended abour 45 minutes later. Ernst said she hosted the Maquoketa forum to discuss veterans-related issues. “It was really hard. We had a veterans roundtable and we’re gathering a lot of information about veterans initiatives and where we need to do better, so there were a number of issues that were presented and it was really hard to delve into those issues…when you had so many other people talking over those veterans,” Ernst told reporters in Clinton. The crowd at the Grassley town hall. Grassley told Radio Iowa this morning that he “enjoyed” interacting with the people who attended his town hall meetings in Iowa Falls and Garner yesteray. Grassley said the crowds were “rambunctious,” but he doesn’t think any of them were paid protesters. Senator Grassley speaks at his town hall. Grassley said he’s “glad” his two events and the one Ernst held in Maquoketa got national media attention. Grassley said “representative government is a two-way street” and he told radio reporters this morning that “face to face dialogue” with voters is vital. “I would just simply say I see it the way I see it, as just interested constituents who want their views to be known and they feel very strongly about them.” Grassley said. Ernst told reporters in Clinton yesterday that Republicans in Washington are focusing on promises made to voters during 2016. Ernst also held a private meeting in Davenport with a cancer support group yesterday. Tomorrow morning, Senator Grassley plans to hold a town hall meeting in Charles City.